UDig’s Client Services team has partnered with our Engineering team to revamp the way we conduct client requirements gathering. This partnership has allowed for an increased universal understanding of a client’s wants and needs through intuitive user story development, consistent stakeholder engagement and workflow-centric design. While the benefits of such a practice are apparent for project management and development, our team discovered a few hidden benefits of this practice as it matured. Requirements gathering is certainly not a new concept. Engaging with clients early and often from the inception of a project builds trust, prevents rework and provides direction for the team. In an Agile environment, development teams need requirements early to start design quickly. As a Project Manager, it is critically important to solicit accurate requirements in a format that makes sense to the client, designers, developers, engagement managers and beyond. The cornerstone of this process has been the user story. User stories capture what a system user needs to do in a format that any stakeholder throughout the agile cycle can understand. 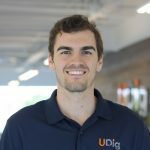 UDig has long employed this methodology to translate functionality into business language but has recently employed a new all-inclusive strategy. Any scenario can benefit from this methodology as it provides a logical structure that developers can easily understand, project managers can easily track and clients can easily verify and tweak.